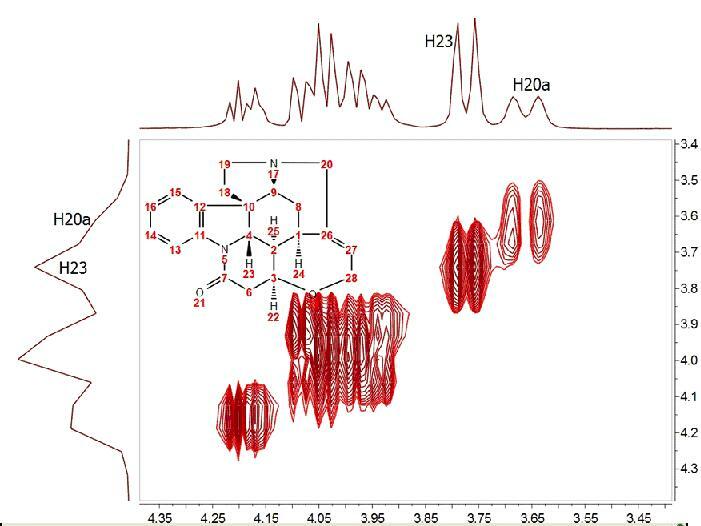 Resolution and sensitivity are two key factors in NMR spectroscopy. In the case of 2D NMR, the resolution of direct dimension (f2) depends, among other things, on the number of acquired complex points whilst the resolution of the indirect dimension (f1) is directly proportional to the number of increments (or number of acquired FIDs). Where n is the number of scans per t1 increment, N1 is the number of T1 increments and Tav is the average length of one scan. This usually means the resolution of the indirect dimension f1 is kept lower than that of f2. For example, let’s consider the COSY spectrum (magnitude mode) of Strychnine which has been acquired with 1024 data points in the direct dimension and with 128 t1 increments. It’s clearly appreciated that the resolution along F2 is much higher than the one along F1. 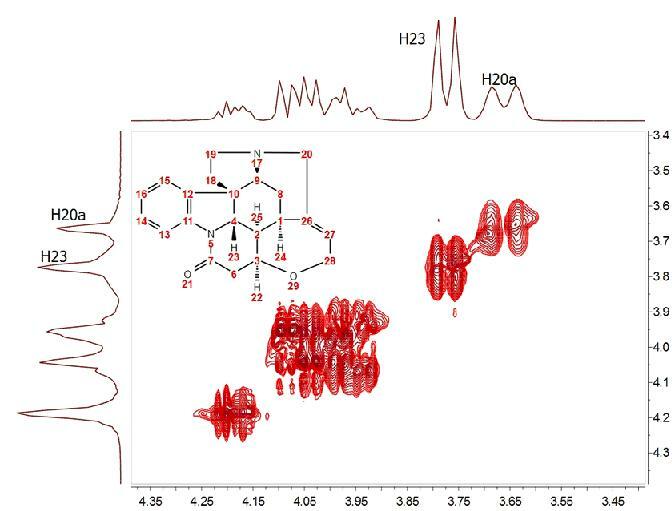 You can easily see that doublets corresponding to protons H20a and H23 are resolved in F2 but not in F1. It can be observed now that the resolution along f1 is slightly higher than in the previous case but we cannot still appreciate the inner structure of the multiplets (e.g. H20a and H23). Zero Filling is certainly a good technique to improve resolution but of course, it cannot invent new information from where it does not exist. In this case we have zero filled from 128 to 1024 data points (e.g. 4 fold). In theory, zero filling by at least a factor of two is highly recommended because it enforces causality but beyond that, the gain in resolution is purely cosmetic. We might get more data point per hertz, but no new information is achieved as it’s shown in the figure above. Is there a better way to extrapolate the FID? In this case, we have extended the t1-FID from 128 to 512 data points and then zero-filled up to 1024. Now we can see that the f1-lines are narrower but the couplings cannot be resolved yet. In recent years there has been a great interest in the development of new methods for the time-efficient and processing of 2D (nD in general) NMR data. 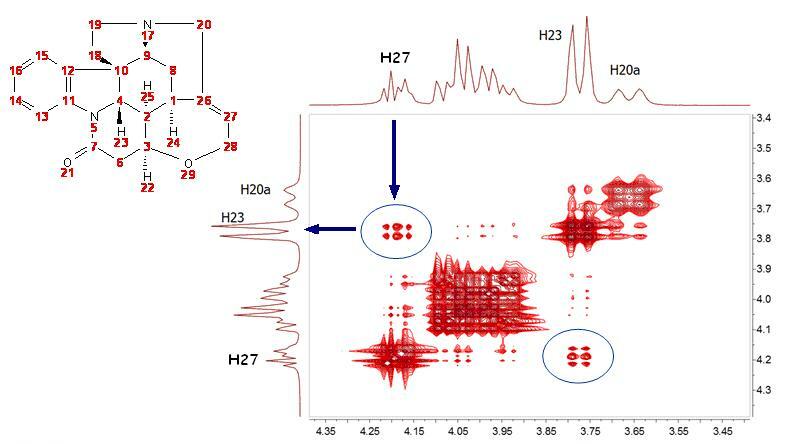 One of the more exciting methods is the so-called Covariance NMR (http://spin.magnet.fsu.edu/software/covNMR/covNMR.html), a technique developed by Brüschweiler et al. In fact, there are several types of Covariance NMR: Direct, Indirect Covariance NMR (there is a third method, Unsymmetrical Indirect Covariance which can be considered as a subtype of Indirect Covariance NMR). In this manual we will cover only the first type, Direct Covariance NMR leaving the other 2 types for future tutorials. At first glance, this result looks like a kind of magic: Now the splitting of H20a and H23 are clearly resolved in both dimensions. Actually, the resolution along F1 is virtually analogous to that of the F2 dimension. How did we arrive to such a good result? From an intuitive stand point, what we have attained here was a transfer of the resolution of F2 to the F1 dimension. In other words, we have applied a mathematical process which takes advantage of the higher spectral resolution in the F2 dimension to transfer it to the F1 one. Where C is the symmetric covariance matrix, F is the real part of the regular 2D FT spectrum and FT its transpose (NOTE: direct covariance NMR can also be applied in the mixed frequency-time domain, that is, when the spectrum has been transformed along F2. In this case, a second FT will not be required; neither apodization or phase correction along the indirect dimension). In order to approximate the intensities of the covariance spectrum to those of the idealized 2D FT spectrum, the square root of C should be taken. Root squaring may also suppress false correlations that many be present in FTF due to resonance overlaps. aking the square root of C matrix is in practice done using standard linear algebra methods (in short, diagonalizing the matrix and then reconstruct C1/2 using eigenvectors and square root of eigenvalues). So direct Covariance NMR is able to produce a 2D spectrum in which the resolution in both dimensions is determined by that resolution of the spectrum in the direct dimension. 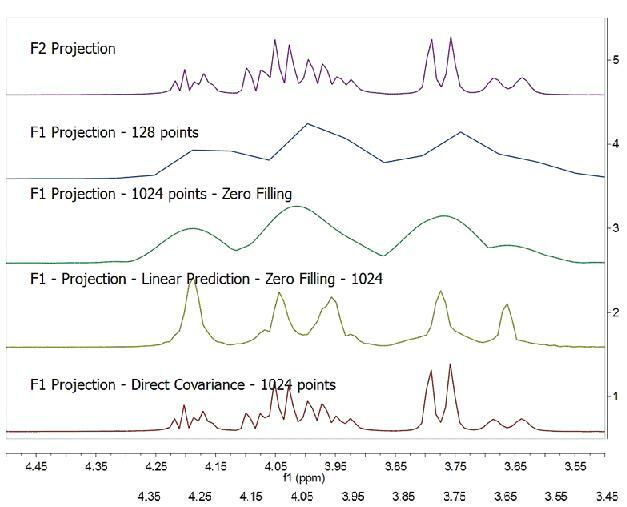 Let´s see a stacked plot representation with the 1D projections obtained from the different processing methods described here (Zero-Filling, Linear Prediction and Direct Covariance NMR). 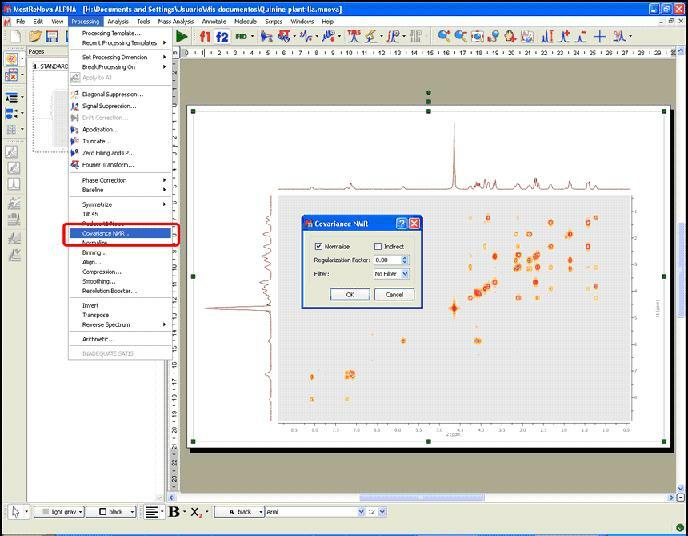 You can see in the picture below the power of the Covariance NMR method. Covariance NMR spectroscopy provides maximal resolution along the indirect dimension, but when the number of acquired data points is too small, the covariances exhibit poor statistics that manifest themselves as spurious cross-peaks. For example, in this case we can see some unexpected cross peaks (e.g correlation H27 and H23 which in principle should not appear in a GCOSY spectrum, but rather in a TOCSY spectrum). Some other artefacts might also arise when protons of different spin systems are coupled to resonances with overlapping proton multiplets. The advantage is obvious: Indirect Covariance NMR yields a 13C-13C TOCSY correlation without having to detect the 13C nucleus. In other words, it brings in a sensitivity increase of 8 over a 13C detected experiment. Of course, in indirect covariance NMR spectroscopy, the spectral resolution along both frequency axes is determined by the sampling along the evolution t1 time.